“O Captain! 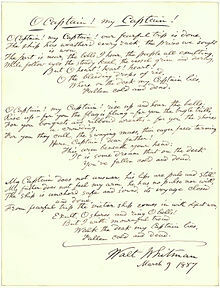 My Captain!” is a poem written by Walt Whitman in 1865. It is an elegy or mourning poem, written to honor Abraham Lincoln. The poem is an extended metaphor with Lincoln serving as the captain of a ship, symbolizing the United States. The poem was featured prominently in Dead Poets Society, the film that featured Robin Williams‘ Oscar-winning portrayal of John Keating, a teacher at a stuffy boys-prep school. The students show their support for Keating at the end of the film by standing on their desks and reciting the poem, in defiance of the school’s headmaster’s decision to fire their beloved teacher. The poem has been featured in several anthologies, including Whitman’s Sequel to Drum-Taps and later editions of Leaves of Grass. Comedic legend Williams passed away yesterday at the age of 63. These volumes and the film are available for borrowing at the Library. Falvey also has other films featuring Williams.